Hidden beneath the green leaves of papaya and banana trees, a hose shoots a stream of water that bounces off the lush crops. Bernard Makachia’s farm near Mwanza, a port city on the shore of Lake Victoria in northern Tanzania, feels like stepping from dry farmland into an oasis. Beyond Makachia’s farm, the land is almost red in colour and only last season’s dry stems bear witness to any sign of crop farming. “None of my neighbours are farming because they are waiting for the rain, but I’ve already started. If you have a supply of water, you don’t need to worry about the climate,” 50-year-old Makachia says. During the dry season, Makachia relies on four solar panels that power a deep-well water pump. The pump supplies 10,000 litres of water daily to his vegetables and fruit, and, since he installed it three months ago, his 3,000 papaya trees have grown tall. “It is not expertise that makes my plants grow, but water. I want to tell the community that everything is possible when you have a solar-powered water supply,” he says. Makachia is among almost 100 farmers in the regions near Lake Victoria who have installed solar-powered water pumps through loans from the company Simusolar. Instead of investing in a fossil fuel generator, Makachia pays off the solar panel equipment monthly, and after 18 months he will own it. Now, a UK-based investment platform, Energise Africa, is aiming to help firms such as Simusolar boost their social and environmental impact, while also providing a potential financial return. The upside is the potential returns are sometimes higher than you would get compared with other returns in the market, and the investment is helping African communities. The downside is the risk is higher because you are investing in a company and your cash is not protected by any UK government safety net. If the company collapses, there is the potential to lose everything. 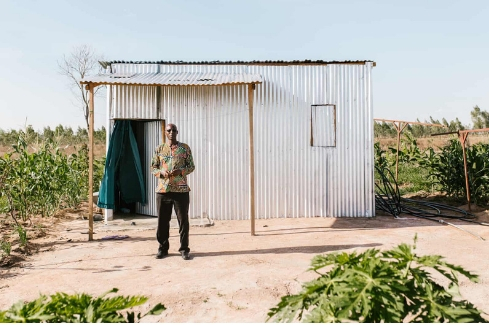 Thanks to the solar-powered pump, he hopes to make agriculture a profitable business in this northern corner of Tanzania, where only 1.1% of farmland is irrigated, according to data from Tanzania’s National Bureau of Statistics. Although agriculture is Tanzania’s largest sector of employment, comprising 67% of all jobs, the majority of farm workers cultivate small-scale farms and earn an average of only US$1.90 (less than £1.50) a day. However, with solar-powered irrigation, the income of Tanzanian farmers could improve, argues Arnold Mlokozi, an agronomist at Simusolar. “With solar power, you can irrigate several times a day and increase your area, number of crops and productivity. When you rely on a fuel generator, you are pressed to irrigate before the fuel runs out and you end up irrigating for a shorter time,” he explains. According to a survey by Simusolar, farmers with solar equipment for irrigation have increased their income tenfold on average, and typically employ two labourers each. One of Makachia’s day-workers is Osman Leonard, who walks across his own dry farmland to reach the lushness of Makachia’s field. The 28-year-old neighbouring farmer has planted millet for Makachia and has arrived to collect his payment. Teasingly, Makachia tells him to sell off a cow and invest in a solar-powered pump, so that he too can start a similar agricultural business. Leonard shrugs and nods at the same time. His enthusiasm for solar power reflects a growing trend across the African continent to use the abundance of sunshine as a source of energy. However, solar panels can be too costly for Tanzanian farmers. It was only when Simusolar introduced mobile technology to track payments and allow customers to pay in instalments that farmers near Mwanza began investing in solar power. “What really did it was the pay-as-you-go system and financing solar power with mobile money,” says Simusolar’s chief executive, Marianne Walpert. The gradual payment plans allow farmers to pay according to their income as it fluctuates with the seasons and mobile money frees the farmers from sometimes hour-long trips to the city. As it gets easier to grow a business, the rural communities experience the benefits, Walpert argues. “We focus on businesses because if people have an income, it solves problems like education, as well as enabling people to care for their families,” she says. While solar-powered pumps empower farming businesses, they also offer a resource that is increasingly in high demand among Tanzanian farmers: a reliable flow of water. Severe droughts and extreme weather in parts of the country have led to periods of decline in crop production, and in a report from last year, Tanzanian researchers suggested that one of the most effective ways to tackle the effects of climate change is to invest in irrigation of farmland. The drought last year made farmer and businessman Aaron Magembe realise that he needed an alternative method of irrigation. “Last year, our problems started in August. My papaya trees were dying, and I had to buy a petroleum pump, but it couldn’t reach all my land,” the 48-year-old farmer elaborates as he walks between his papaya, lime and orange trees while narrowly avoiding the slippery ditch between them. In July this year, he installed two solar panels next to a stream that runs past his field, and when the sun is bright, the solar panels produce enough power to pump 2,000 litres of water per hour to his farm. While solar power handles the irrigation process, Magembe gets time to tend to his business of selling papaya seeds and fruits to the local and regional market. He proudly estimates his business to be among the top 20 papaya suppliers within Tanzania, and believes that solar-powered water pumps can make the soil a source of larger growth for more Tanzanians. “If a thousand people in the Mwanza region had this equipment, agriculture would really move forward,” he says.